Isn’t it funny how life works? Actor Brad Pitt claims leaving “religion” behind helped him discover who his is. And yet, for millions of people around the world, entering a life of faith accomplished the same thing. 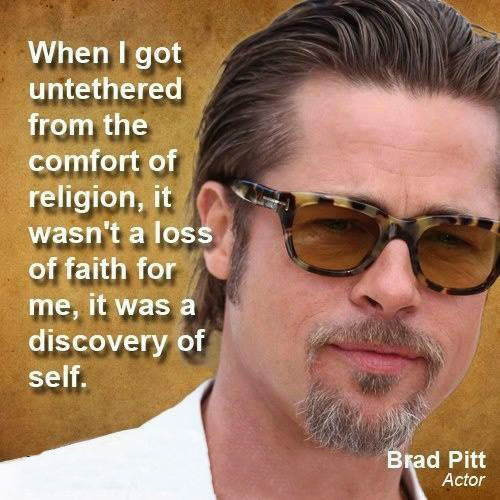 What fascinates me about this graphic (found on an atheist Internet community) is Pitt’s words about the “comfort” of “religion” (a word I dislike – it carries a ton of negative baggage with me and with many others). I’m a serious Christian. Is my faith in Jesus Christ — whom Christians believe is the son of God — a comfort? Of course it is. Just as a fat bank account or a prestigious career is a comfort for many others. I’m comforted knowing that because I believe in and follow Jesus, His sacrificial death on a cross wipes my slate clean with the creator of the universe. God no longer sees the bad things I’ve done and the good things I’ve failed to do. He sees me as He sees Jesus – “in Him there is no sin” says a section of the Bible called ‘1 John’ . But there’s something very uncomfortable about that, too. If I take what Jesus did for me seriously, then I’ll want to live up to His remarkable gift. I’ll want to welcome Jesus into my life so He can guide me away from bad behaviour and towards doing good. You might think that’s easy to do and why on earth would I need Jesus to pull it off? I’ll tell you why: because it’s NOT easy to do. I miss the mark, of being the kind of person God knows I can be, so often that I don’t even realize it. And so does every other person on this planet. It’s like we live blindfolded, believing everything our culture tells us, thinking we look so cool and “together” when, in God’s eyes — and He knows you and me better than we ever could — we are stumbling around like drunken fools. That’s one part of the “discovery of self” that Brad Pitt mentioned. The other part is this: as a follower of Jesus Christ, I know that God loves me more than my wife, more than my parents, more than my stepkids. More than all of them put together. That’s pretty remarkable, especially as most of us (whether we acknowledge it or not) live with a harsh critic in our heads. Think hard about this: how often do you put yourself down? Do you even recognize all those occasions? Then consider this: God knows all your shortcomings. All the bad things you’ve done and the good things you’ve failed to do. Yet He loves you. And loves you so much that He offers you the gift of His son. All you have to do is accept it. If you do accept that gift with a sincere heart (not just as a way to avoid judgement when this life ends), then you’ll start on a journey of self-discovery that will leave Brad Pitt’s in the dust. Agree? Disagree? Post your thoughts below and let’s have a conversation.